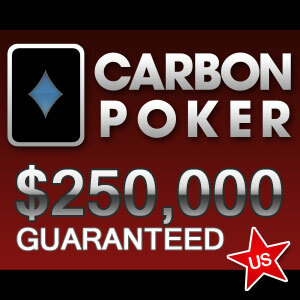 Things have definitely been happening at a fast pace at Carbon Poker in the last few days. The departure of PokerHost to the Equity Poker Network prompted the desegregation of skins on the network – with the result that the action on Carbon Poker´s cash game tables increased by 50% overnight – the Bad Beat Jackpot was re-introduced, and now the site has announced an eighty-event Online Poker Series which will include a $250,000 guaranteed Main Event. 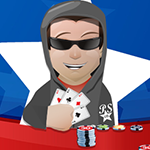 The changes have already resulted in a significant leap in traffic according to the poker traffic monitoring site PokerScout.com, with the Merge Gaming Network – for which Carbon Poker is the flagship site – now occupying third place among poker networks accepting players from the US behind Bovada Poker and the Winning Poker Network. Segregation of sites on the Merge Gaming Network has been ongoing since 2011 for specific heads-up and cash games, but a major split in the network occurred when sites owned by Jazette Enterprises ring-fenced their players in May 2013 – causing traffic on Carbon Poker to reduce by about 33%. Those sites have now returned and, following the desegregation, players on Carbon Poker have been reporting significantly more cash tables open, a higher level of liquidity and softer players. The major benefit of this for new players is that it will now be easier to clear the Carbon Poker bonus and reload bonus. 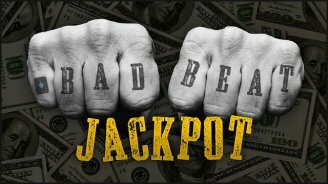 The Bad Beat Jackpot was originally discontinued in November 2012 when the Jackpot was last hit for $599.000, as Carbon Poker felt its removal would ensure a healthier poker room ecology. At the time the Black Beat Jackpot was only available to players who paid a premium to the rake on dedicated Jackpot tables; but, in its reincarnated format, Carbon poker will be funding the Jackpot from the standard rake deducted from all cash game tables. The site is initially funding the Jackpot with $1,000 and will add $0.10 per minute until the Jackpot is won. This would mean that the prize pool will increase by $1,008 each week. In order to win the Bad Beat Jackpot three players must be dealt into a hand and two must go to showdown – with both players having made Quads using their pocket cards. The player who suffers the Bad Beat will receive 38% of the Jackpot pool, while the winner of the hand gets 20.5% of the pool. A further 20.5% will be shared between the other players seated at the table at the time the Bad Beat Jackpot was won, with the remaining 21% going to seed the next Jackpot prize pool. It has not been that long since Carbon Poker was able to host a tournament with a $250,000 guaranteed prize pool – the last time that happened was in September 2013 as part of Poker Maximus VI – but in recent months a return to such optimistic events seemed unlikely. However, as part of the Online Poker Series which starts on the 4th May, Carbon Poker is once again confident that a prize of this magnitude will not leave them too much out of pocket. The full schedule for the eighty-event Online Poker Series can be found in the Carbon Poker client and includes a comprehensive range of tournament formats played in disciplines such as NL Hold´em, PL Omaha, 7 Card Stud and Badugi, with a couple of mixed-game HORSE tournaments thrown in as well. The stand out tournament is the $215.00 buy-in Main Event (OPS Event #71) which guarantees a $250,000 prize pool and gets underway at 3:00pm (EST) on Sunday May 18th. Stacks of satellites are already underway for this event, which will have the option to re-enter and late registration for 4½ hours (eighteen levels). Chances of an overlay? Pretty slim if the increase in traffic over the past few days is anything to go by!